Trying to think of something to do for this section of the forums, I thought that it might be nice to have a place where members could post flash fiction. Now, "flash fiction," for those of you that don't know, is simply a very short story. You try to tell either a simple story, or convey some sort of idea, all within the confines of a few hundred words or so. Since this is primarily a Kingdom Hearts website, I thought it only make sense that this thread be Kingdom Hearts-related. In this way, it becomes a thread for people to post tiny pieces of fanfiction that they might have otherwise considered to short to post in a standalone thread. I'm going to set the word count to no more than 1500. We'll see how well that goes first, and then I'll adjust the limit as necessary. Have fun! I'll jump things off with pointless, lighthearted fun. Amber lamps only just illuminated the vacant library inside King Mickey's castle. Though most of the castle retired to their beds, the soft glow continued to reveal the worn spines, should a lonely ghost find themselves wandering at night. However, on this particular night, the dim, golden radiance cast aside the shadows for a pair of yet dimmer lights. “Your pieces are mine!” shouted Sora, his brow furrowed by nothing short of intense concentration. “Ya won't beat my defense that easily!” came Goofy's reply. The two of them each held five playing cards in front of them, their eyes shooting back and forth from their hand to their opponent. The tension grew so fearsome, that even Donald had to put away his utter inability to comprehend the situation. A pin drop could have shattered the world, and the silence could only last for so much longer. Finally, Goofy paved the way for sound. “Gosh, whad'ya mean, Donald?” Goofy scratched the top of his head, a poor attempt at deep thought. “Okay, Goofy. Your roll,” Sora said as he aimed a cannon at the dog-man. Face serious, Goofy rolled a pair of dice across the table. “Listen to me!” Donald screamed, followed by a series of unintelligible quacks and the violent flailing of his wings. The two dice, once stopped, added together to equal nine. In response, Goofy picked up the checker board and shoved it, pieces and all, inside the cannon. Sora lit the fuse, and the board game was sent careening through one of the library's stained-glass windows. After the smoke cleared, the two turned to Donald. The duck's eye twitched, as his gears devised the most appropriate answer as he could muster. Staff in hand, a thunderous storm rained down upon the duo until the early hours of the morning. And thus, Mickey got no sleep that night. Sure, I've doubled the word limit to 1500. “Roxas! How’s this?” Xion walked in, carrying a pot three times her size. “Woah! Let me help you with that…” Roxas hurried over, grabbing the other side of the pot. The two carried it to the middle of Roxas’s room, setting it down on the ground. Xion put her hands on her hips, taking a long look at the giant pot. Roxas stood on his toes, peering inside it. “Gaahhh!” Vexen yelled out in disbelief, after entering the castle’s kitchen. “Argghhh!” Vexen turned back around, throwing his head into his hands. Lexaues simply stared in confusion. “Okay! Let’s make sure we have everything before getting started,” Roxas said. “Right! Let’s see…we’ve got the flour, the eggs, butter, sugar, baking powder, the pans….hmm….I know there’s something missing….” Xion placed a hand on her chin, concentration on what that might be. Roxas and Xion turned to face one another, as they both realized what was missing. “The ice-cream!” they both yelled out in unison. “Hey…did someone say ice-cream?” Axel said, walking in through the doorway. Both Roxas and Xion jumped up in surprise, looking very nervous and tense. They stood completely straight, neither of them daring to make any sudden movements. “Nothing! Nothing at all…” Xion said, letting out a nervous laugh. “Huh…oh yeah! It’s great!” she said, with a nervous smile. Once he was out of sight, the two relaxed, as Roxas set down the pot. The two let out a sigh of relief. Roxas and Xion were tip-toeing through the Library, looking around carefully. It was night, and the only thing lighting the area was a small flame, coming from Xion’s hand. When the two came up to one of the bookshelves, they stopped to browse through the books. “Aha! Here we go…” Roxas said, pulling out a book. On the cover, it read: Dates and Records of the Organization Members. Xion leaned in, as Roxas began flipping through its pages. “Yes!” Xion said, as the two smiled in their achievement. “Axel’s gonna be so happy when he finds out what his birthday is!” Roxas said. “Then we’d better get to Twilight Town, and mix the ingredients there; so Axel won’t have a chance to see us” Xion said. “Right! Let’s go,” Roxas said, opening up a portal. When the two made their way to Twilight Town, they set the pot down on the roof of one of its larger buildings. 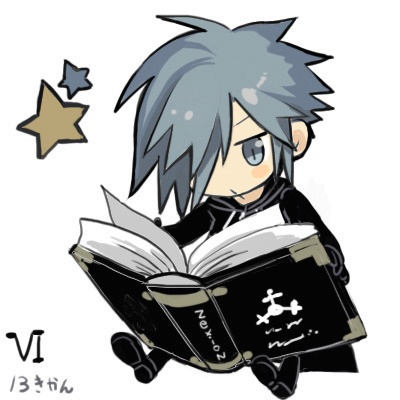 “Hmm…let’s see…” Roxas pulled out a small book. On the cover it read: Recipes That Never Were. “Yes!” Vexen said, still troubled by his loss. “Yes…this is very dangerous indeed…” a voice said from above. Lexaues and Vexen turned around, to see Saïx standing over them. Roxas walked toward Xion and the pot, holding five blue ice cream bars in his hands. “Huh?” Roxas looked inside the pot. The ingredients were bubbling; turning into a white and gray color. “Well…we’ve never made a cake before…maybe that’s the way it’s suppose to look,” Roxas smiled, and dumped the ice cream in. “Oh yeah…” Roxas said, reaching into the pot. But before he could make contact, the mixture began to expand, rising up and out of the pot. “W-what’s going on? !” Xion said. The mixture grew even larger, towering over the two. Two strands extended out of the mixture, like arms, and another two at the bottom, like feet. The newly formed creature stepped out of the pot, and let out a giant roar. From its mouth, it spat out globs of cake batter that appeared to be on fire. Axel was walking out of the hallway, making his way into the The Grey Area. Everyone was rushing back and forth, looking in every direction. “I just checked the Computer Room…it appears it is without success as well” Luxord said. “Err..” Saïx said, looking down at the ground in frustration. “Hey! What’s going on?” Axel said, walking up to Saïx. Everyone suddenly stopped what they were doing, staring at Axel in shock. “What? What’s going on?” Axel said, looking around in confusion. “Retrieve them…and bring the pot back here...immediately,” Saïx said sternly. Roxas ran around the buildings edge, careful with the little space he had. The monster continued to shoot its orbs of cake batter, while Roxas continued to dodge. Xion hurried to the other side, ready to strike. Right as the monster came around to face Xion, Axel comes out of a portal. Xion dove straight towards the monster, slicing though it with her keyblade. The monster shook for a moment, letting out a bubbling sound. It flexed inward, then exploded, sending cake batter in every direction, covering the entire roof, Roxas, Xion, and Axel. The three looked at one another in shock, covered in a gooey mess. Axel looked down at himself, his hands, feet, and his robe tattered from top to bottom. The three looked at one another with a smile, and laughed.